You'll have ample storage space for your room decor with this drawer dresser. 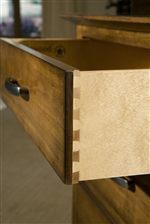 The piece carries a warm brown finish and features silver-shaded handles as well as tapered feet. 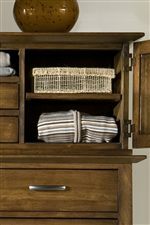 In addition, the nine drawers are wonderful for keeping sweaters, jeans, stockings, pajamas, blankets and sheets. Plus, the jewelry tray and drawer deck are great for holding all your smaller valuables. Meanwhile, the matching landscape mirror includes a bevel glass plate, which is excellent for getting ready in the morning. 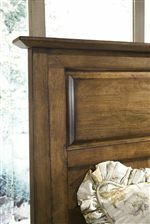 With its emphasis on simplicity, form and honesty, this dresser is sure to provide the perfect balance of function and fashion into your bedroom setting. The Baisley Park Dresser w/ Drawer Deck and Landscape Mirror by Linwood Furniture at AHFA in the area. Product availability may vary. Contact us for the most current availability on this product. 200-406 Drawer Deck 1 62.5" 9" 5.5"
200-233 Dresser 1 68" 21" 37.5"
200-205 Landscape Mirror 1 43.5" 35.5"